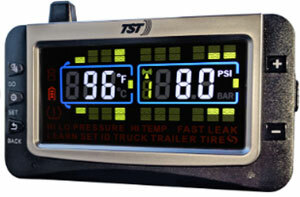 The TST Truck Systems Technology's Tire Pressure Monitors are the best Tire Pressure Monitoring systems available today. It's as simple as that. HOW DO TST Tire Pressure Monitors BENEFIT YOU? Properly inflated tires provide better vehicle handling, greater fuel economy, shorter braking distances and longer tire life. SAFETY: TPMS enhances the overall safety of the vehicle by detecting under-inflated, over-inflated, over-heated and slow and rapid leaking tires. FUEL SAVING: Increase fuel economy while maximizing tire casing and new tire wear. Under-inflation by 20 percent causes an estimated fuel mileage drop of 2% - this can add up to thousands of dollars in additional fuel if the proper tire pressure is not maintained. TPMS allows the fleet to program the level that the system will alarm for low or high pressure so the pressure can be maintained to assure safety and increased fuel economy. LONGER TIRE LIFE: Running inappropriate tire pressures can cause rapid or poor tire wear – statistics show that a 20% under-inflated tire can reduce new tread life by approximately 25% and that 90% of tire failures are caused by under-inflation. Additionally, tires that are under-inflated by 20% lose approximately 30% of the life of the casing and may prevent the fleet from achieving multiple retreads. Well maintained tires can be safely retreaded up to (5) five times to a useful life of over 1 million miles. EASY MAINTENANCE: A tire management system is only effective if the driver is able to easily use it. With TST Flow Through Sensors, there is no sensor removal required to add or delete air which passes directly through the valve stem mounted sensor. This minimizes the chance to lose sensors and eliminates the loss of air which is evident with other sensor systems. Tire Pressure Monitors allows air to flow directly through the sensor to the tire without removal, minimizing time and costs without losing sensors. AFFORDABLE: TST Truck Systems Technology believes that safety should not be prohibited by cost. The TST Tire Pressure Monitoring System is priced to allow rapid return on initial investment while improving vehicle safety and efficient operation. An ROI can be expected in as little as 6 months to a year. REDUCED LIABILITY EXPOSURE: TST Tire Pressure Monitors reduces overall liability exposure for property damage, workers compensation and insurance cost increases from tire blow-outs and tire separation. REDUCED INSURANCE COST: Most insurance companies use Accident data as one of the important determining factors of your premium. They also reduce your premium if you have a written viable Safety program. REDUCE VEHICLE DOWNTIME: Most accidents put the vehicle out of commission. Towing can impound the vehicle for days, especially if on a weekend or holiday. The vehicle is down while tire repairs are being made and while waiting for the repairs to be made. It's down permanently, if extensive damage was caused by an unexpected blow out. IMPROVE ROI: For example, a 10 PSI under-inflation level has been shown, by conservative estimates, to reduce fuel economy by more than 0.5%. A 20 PSI under-inflation level reduces fuel economy by up to 2.0%. For a truck running 100k miles per year, this could mean that the vehicle would need to use an extra 340 gallons of fuel (based on an average of 6 mpg). At current diesel fuel prices, the added expense to run an 18-tire vehicle, at 20 PSI below optimal inflation levels, would cost an extra $1,700.00. And Fuel is only 1 type of savings. See "How can fleets calculate ROI?" at the lower end of this page. Peace of Mind: Something that comes with knowing your using the most reliable system available today. What differentiates TST Tire Pressure Monitors from other Tire Pressure Monitoring Systems? Several things beginning with a ruggedized Sensor that does not have to be removed to air-up the tires. This makes the system easy to install and even easier to maintain proper tire pressure levels on individual and commercial fleet vehicles. The system not only monitors and alarms for Low Pressure, High Pressure, but also for Rapid Leaks and Tire Temperature. Alarm levels are adjustable by the user and are programmable by axle. And the entire system is programmable to any vehicle with up to 8 axels and 32 Wheels. What items are included in a standard kit? Each kit contains a TST Monitor, which includes a Mounting Bracket and a 12 Volt Power Cable; from 4 to 22 5 to 7 year Tire Sensors (depending on Kit purchased); a Repeater (Signal Amplifier); a Power Cable; a User Manual and a 3 Year Warranty. What programming is required at the time of installation? The Sensors each have an identification number that can easily be entered into the TST Monitor. The monitor uses touch screen programming to set the desired number of Axels and Tires. The system is easily programmed to alarm levels that are appropriate for the user. The Installation manual contains information on how to adjust the initial alarm settings which are Low Pressure Alarm (40 PSI), High Pressure Alarm (140 PSI) and Tire Temperature Alarm (185° F). Each unit can also be Identified for Fleet management. No. It is quite simple to install on most vehicles although professional installation is always recommended. Tire Sensors mounted externally are very easy to install. This mounted internal (if chosen) should be mounted by your maintenance personnel. Mounting the Repeater would be best by maintenance personnel, also. What are the basic installation steps? Clean the valve stem first, then thread a sensor onto it. Enter the sensors barcode number into the Hand Held TST Monitor, manually. Future improvements will allow for the use of an RFID internal scanner in the TST Monitor. Attach the base to the Handheld TST Monitor, or Velcro the monitor directly to a convenient location on the dash. Connect one of the included power cords (hardwired to the vehicle ACC or use the cigarette power adapter. Mount the Repeater (amplifier) and connect the two wire cable to power and ground. Turn on the Monitor by holding the front button for a few seconds and the system will begin operation. Can the TST Tire Pressure Monitors system operate on both 12v and 24v vehicles? Will vehicles outfitted with TST Tire Pressure Monitors interfere with each other? No. TST Sensors are digitally encoded and do not interfere with each other. Does the system monitor actual Tire Temperature? Yes. Unlike many systems that either do not monitor tire temperature or alarm at a relative temperature percentage, TST Tire Pressure Monitors measures the actual tire temperature to within +/- 3° depending on environmental conditions. Additionally, the system will alarm if any tire exceeds the user programmable tire temperature. Does the system indicate that all the tires are in the normal range without having to check each tire? Yes, whenever the system is operating and is plugged into vehicle power, there is a green LED indication. If any tire falls below the low pressure alarm level the LED flashes red. The tire location with the alarm condition is indicated on the LCD display with its pressure level and tire temperature. What happens when the system alarms? In the case of a Low Pressure alarm, the green power LED turns to red and begins flashing. The Monitor indicates (with an icon) the type of alarm on the LCD display, the tire position, the tire pressure and the tire temperature. Can the system be used on large bore tires found on construction equipment? Yes. We can provide large bore adapters designed for the TST Sensor. What is the Limitation of Tire Pressure Monitoring Systems that use BASELINE technology? Most other TPMS products compromise a critical aspect of tire pressure monitoring, which is ease of proper air pressure level maintenance. Ultimately any TPMS system is only as effective as it is usable by the drivers of the vehicle and the maintenance departments. Most removable Valve Cap Sensor based TPMS rely on the existing tire pressure (at the time the sensor is attached) to determine a reference tire pressure, often referred to as its BASELINE. When a Sensor is installed, it records the tire pressure at the time of installation as its BASELINE pressure setting. If you remove and reinstall a Sensor while the tires are warm, the Sensor will record the elevated WARM pressure when reinstalled. This becomes the new BASELINE pressure from which to trigger an alarm. When the tires cool, the pressure could fall enough to cause a false alarm. Obviously this must be done in order to maintain proper tire pressure. Essentially, this defeats the purpose of a tire pressure monitoring system. Will we see government legislation to mandate these systems for commercial vehicles? If so, in what type of time-frame? There will be continued government legislation to improve fuel economy and safety. There are proposals to give incentives to fleets that are willing to invest proactively in these types of systems. TST Truck Systems Technology believes that it is likely some combination of incentives and government requirements will be in place within the next 24 months. Regardless of the government's approach, proactive forward thinking fleets will be implementing systems based on the need for greater safety and quantifiable cost savings. Can the Handheld TST Monitor be used as a Portable Tire Gauge? Yes. It can be removed from the vehicle by unplugging the power source and it will operate on its internal rechargeable battery (see the installation manual for further details). Does the Handheld TST Monitor indicate when the internal rechargeable battery is low? Yes. There is an icon that flashes on the LCD display indicating when the battery is low. What is the size of the Handheld TST Monitor? The monitor dimensions are 5 5/8"L x 3 1/8"W (4 1/2" w/Antenna) x 1 1/2"D.
What type of mounting bracket comes with Handheld TST Monitor? A small mounting bracket clips onto the rear of the monitor which can be attached to the front of the dash. Does the unit have a backlight for night viewing and can it be turned on and off as needed? Yes. The LCD display has an adjustable backlight that the user can set to their desired comfort level. Why is a Repeater included with every system? The integrity of the Sensor transmission signal is important to the overall performance of the system. The TST Tire Pressure Monitors system was designed for all types of commercial vehicles, as well as RVs and towed vehicles. The goal is to eliminate common performance problems and make the installation as convenient as possible for all types of vehicles. By amplifying the Tire Sensor signals, the signal integrity is assured. Can the system be purchased without the Repeater? No, the Repeater is needed for proper operation.. Please see above for details. How is the Repeater installed? There are 2 mounting holes on the Repeater, one on each end. RoadTrucker recommends adding a drop of Elmer's Glue to keep the screws from becoming loose due to vibration. Does the Repeater need to be mounted under the vehicle or can it be placed inside an RV for example? In certain vehicles the Repeater can be mounted inside the vehicle as long is the monitor does not indicate any antenna signal strength errors. It can be tested by powering the Repeater prior to mounting. What is the construction of the Sensors? TST Sensors are encapsulated in a rugged nylon enclosure that contains a solid brass fitting. The electronics are protected by a moisture resistant silicone material that hardens further ruggedizing the Sensor. The silicone insulates the electronic components from extreme temperatures, moisture, salt and other corrosive materials. The result is a slightly heavier, but much more rugged vale stem tire Sensor. Battery life is expected to last up to 10 Years. What is the battery life of the Sensor and are the batteries replaceable after they stop operating? The Sensor battery estimated life is 7 to 10 years depending on environmental conditions and use. The system was designed so that the batteries are not replaceable to increase the ruggedness of the Sensors. Other systems with replaceable batteries can have problems due to moisture leaks in a very short time. The operating life on removable battery TPMS system can be as short as 12 to 18 months, which is not suitable and raises the total cost of owning the TPMS system. Is there a Sensor replacement program? Yes. Please contact TST Truck Systems Technology for details of the Sensor replacement program. Since TST Sensors are numbered can they be relocated to a different tire location for example during tire rotation? Yes. any TST Sensor can be reprogrammed for a different tire location. It is as easy as changing the sensor ID position in the Monitor. Does the LCD display show all tire Sensors at the same time? The display graphically indicates each tire in reference to its location on the vehicle along with its respective tire pressure and temperature. Individual tire data can be viewed manually or programmed to automatically scan all the tires continuously. Should any Tire have a problem, that tire is immediately shown with its Pressure & Temperature, along with a Flashing Red light to draw your attention. Note that 2 vehicle systems will show 1 vehicle at a time. The programmable monitor allows you to show 3 different screen sizes, so depending on the number of tires, you may be able to show them all on the smallest setting. Why is the warranty voided if Metal Valve Stems are not used? The weight of any external sensor can put stress on non-metal valve stems, potentially causing the valve stem to fatigue. This could cause the stem to leak or break down. Neither of which is safe or reliable. What is the weight of the TST Sensor? What are the dimensions of the TST Sensor? What affect will the weight of the Sensor have on wheel balance? Little to no affect on large commercial vehicle tires. Passenger and LT (light truck) designated tires should be spin balanced to ensure proper weight distribution. This is easily done when converting standard valve stems to metal valve stems. Will the addition of tire chemical balancing compounds harm TST Sensors? How can fleets calculate ROI? a) Fleets should determine all the costs directly associated by utilizing a baseline that consists of fuel costs, tire expense, time and labor to manually check tires, rate and cost of roadside assistance, etc. The improvement from the baseline costs will give the most accurate measurement for true ROI over time. b) Tire costs should include new tires & retreads. If the tire pressure is maintained properly for the life of the casing, the fleet should be able to get multiple retreads. A retreaded drive position tire can be relocated to the trailer depending on the type of vehicle and the application. c) Including the cost of road side assistance is an important advantage to consider in gauging a fleet's investment return in a TPMS system. Since approximately half of all emergency roadside assistance calls are found to be the result of some type of tire failure, the savings can be substantial. d) A fleet should also consider the savings that can result relative to the associated liability for preventable accidents due to tire loss, vehicle downtime and customer penalties due to late or mishandled deliveries. e) It is a fact that fuel costs are negatively affected by running improper air pressure levels in tires. For example, a 10 PSI under-inflation level has been shown, by conservative estimates, to reduce fuel economy by more than 0.5%. A 20 PSI under-inflation level reduces fuel economy by up to 2.0%. For a truck running 100k miles per year, this could mean that the vehicle would need to use an extra 340 gallons of fuel (based on an average of 6 mpg). At current diesel fuel prices, the added expense to run an 18-tire vehicle, at 20 PSI below optimal inflation levels, would cost an extra $1,700.00 every year. f) TST Truck Systems Technology estimates that most fleets will have an ROI in the range of 4-6 months, if the total costs are properly accounted for, when using an effective TPMS system.